Tea tins and canisters are truly a must have if you are a fan of good tea. They give you the option of buying as much tea as you need and then be able to store them in their current freshness for as long as possible. When you open tea bags and leave them exposed to the air they lose their freshness rapidly taking out all the pleasure when you finally brew your tea. 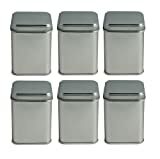 The tea tins and canisters have airtight lids helping you maintain the freshness of your tea without having to buy the smallest portions of tea which can prove to be more expensive. You can get your tea tins and canisters from a wide number of brand manufacturers. For instance, if you love Teavana tea, today you can also purchase Teavana tea tins and canisters from the Tea Supply. Different models will come with various advantages and it is up to you to choose. You can go for the glass bottomed kinds that let you see how much coffee you have left or you could go for those with easy to pop off lids to make your work easier. We have made them all available for you in one place; all you have to do is pick one. Our designer branded terra cotta tea jar is a timeless classic that looks great in any traditional or modern kitchen, the terra cotta lid has an airtight seal to keep contents fresh and dry.